AFTER the Israelites left Egypt they crossed the Red Sea, whose waters divided so that they passed through on dry land. Then they traveled through the wilderness toward Mount Sinai. Passing onward, they wanted water and food; and forgetting the great things God had already done for them, they began to murmur. At a place called Marah, they found the water too bitter to drink; so they grumbled, saying to Moses, "What shall we drink?" He asked God; who showed him a tree, which, when cast into the water, made it sweet. Next the people murmured for food, and God sent them manna, which they gathered every day except the Sabbath; but with all God's care and kindness the Israelites continued to grumble whenever any difficulty arose. Journeying forward, they entered another wilderness, called the Desert of Sin, and came to a place named Rephidim, where they found no water. 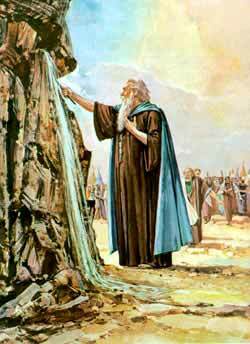 They were very thirsty, and came to Moses murmuring and saying, "Give us water that we may drink." How could Moses do that? He was grieved with them, and said, "Why chide ye with me? wherefore do ye tempt the Lord?" But the people grew so angry that they were ready to stone him. Then Moses told God all the trouble, and God showed him what to do. He was to go before the people, taking the elders of Israel with him, and his rod, and God would stand before him on a rock among the mountains of Horeb. This rock he was to strike, when water would gush forth. Moses did as God commanded. He went forward with the elders, struck the rock with his rod; and the pure, clear water gushed out, so that all the people were able to drink.